Ios, Greece isn’t an island you may have heard about, or if you have it’s most likely associated with young 18 year old partiers who take over the island, but this is not the case anymore. Ios, Greece is a small, beautiful island, apart of the Cycladic islands in the Aegean Sea. 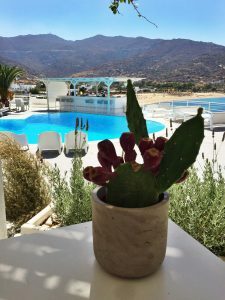 A handful of gorgeous sandy beaches, fun areas to explore, a vibrant village filled with wonderful shops, restaurants and extremely kind people to welcome you. Ios meaning flower, an island that blossoms the more you explore and discover. Because Ios doesn’t have an airport, the easiest way to get there is by ferry via Santorini or the surrounding islands. It’s only a 30 minute ferry ride from Santorini which is very pleasant, just enough time for a nap and to recharge. You dock at such a quaint little village port called Ormos which is surrounded by restaurants and shops, looks like something out of a movie. The island only has five taxi cabs on the entire island, hard to believe I know but when it’s off season, there is no need for many. I recommend arranging for hotel transportation or renting a car (they have rental car companies at the port and all over the island). Regarding hotels, there are many to choose from, but the one I recommend is Ios Palace Hotel & Spa. Located right above Mylopotas Bay, so the view is magnificent and the location is superb, just seconds to the beach. You have all beach access with lounge chairs, plus so many restaurants, bars and day clubs to choose. Some clubs and bars are catered more towards the younger party crowd, but they’re located further down the beach away from the hotel. Check out the hotel’s website by clicking on their name above. Ios Palace Hotel & Spa is a very modern feel intertwined with the culture and ancient natural surroundings of Ios. The rooms are modern, very roomy and clean with amazing views of the bay area, some suites have private pools. 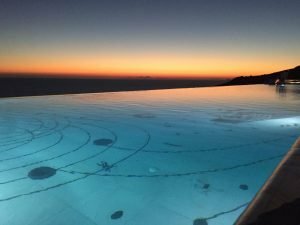 The two pools are in a gorgeous setting, one an infinity pool and the other located higher above, a bit more intimate with luxurious sun beds. I highly recommend Ios Palace Hotel & Spa. 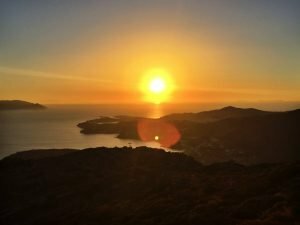 If you’re into exploring, Ios is the perfect island for you. 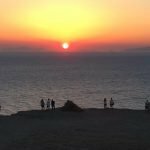 From windsurfing, pedal boats, snorkeling, scuba diving, taking a sunset cruise, visiting Homer’s Tomb, Odysseas Elytis Theatre, incredible sandy beaches with crystal clear water, day trips to surrounding islands or shopping in the village of Chora, there is something for everyone! 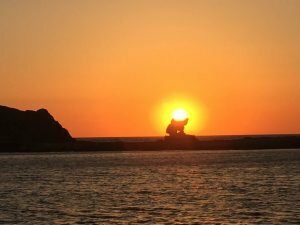 My husband surprised me with a beautiful sunset cruise while we were there, and we can say it was our most favorite memory of visiting Ios. We were met at the port by host Ileana, who is vivacious, happy and incredibly nice. She took us to meet our boat and Captain Pandelis. It was a small wooden boat, good enough size for just us to enjoy the evening. A gorgeous clear night we sailed off to a cove where the water was crystal, emerald green in color. 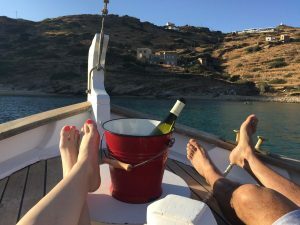 While anchored there for about an hour, we swam, explored and enjoyed a chilled bottle of white wine and fruit on the boat. It felt like a romantic dream not wanting it to end. Captain Pandelis then took us around the other side of the island to Koumbara Beach, in a cove where we experienced the most stunning sunset we’ve ever seen! He opened up a bottle of red wine and from afar, symphonic music played as if it was choreographed with the setting of the sun. I couldn’t keep my eyes off how flaming orange and vibrant the sun was as it dipped into the ocean. Day trips and sunset trips are Sunkissed in Ios’ specialty. 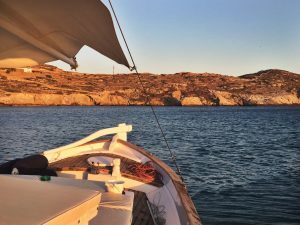 I highly recommend taking one of their cruises and ask for the dream team Ileana and Captain Pandelis, their hospitality, philoptimo and knowledge of the island will make your Ios visit even dreamier. Check out their Facebook page (click on name above for link) and their Instagram page under sunkissed_in_ios to find out more and see their beautiful photos. Nightlife is definitely not lacking on this island. 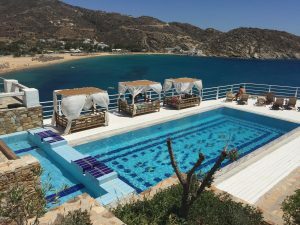 So many options to choose from such as day clubs on the beach, to lounges and dance clubs in the village Chora, there’s something for every age. From the Far Out Club catered to younger people (18 – 25) to day club Free Beach Bar being a more trendy, sophisticated, artsy feel, you have so many to choose from in one mile of beach, and that is just one area of the island. 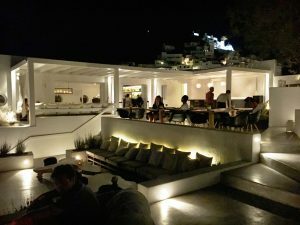 My of two favorites are the Ios Club with delicious cocktails, a chill vibe and candlelit ambiance while sitting outside overlooking the most beautiful bay and the Pathos Lounge Bar, like nothing you have ever seen! Both so different from another, but both absolutely stunning. The best way to describe each is to see them for yourself, or at least my photos and video below. Check out their websites for more information and photos (click on name for link).